For centuries, cast iron pipe and fittings have been the backbone of drain, waste and vent plumbing systems throughout the world. Cast iron is as reliable as it is enduring. As building codes have gradually given way to increasing use of PVC in both residential and commercial applications, plumbing engineers and contractors should remember that what is allowed by code may not necessarily provide the best solution. In fact, from a liability standpoint, maintaining the original specification and avoiding substitutions can be critical. 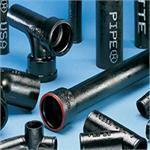 For residential and commercial applications, Charlotte Pipe and Foundry produces the broadest line of cast iron pipe and fittings in the industry, including a full line of Service, Extra-Heavy and No-Hub (hubless) pipe and fittings.